Violin is for classical and jazz while fiddle is for folk, country, and bluegrass. But is that really true?If I had a dollar for every time someone has asked me at a wedding reception or a coffeehouse gig if I play fiddle or violin, I could quit my day job and spend more time playing my – well, violin or fiddle. I usually answer, “They’re really the same instrument, just different kinds of music.” You know: violin is for classical and jazz while fiddle is for folk, country, and bluegrass. But is that really true? The cover of Strings magazine proclaims it is “for players of violin, viola, cello, bass, and fiddle” as if violin and fiddle are separate and distinct. Over in the musicology department, The New Grove Dictionary of Music and Musicians defines “fiddle” as “a generic term for any chordophone [stringed instrument] played with a bow.” This instrument group includes the violin and many other instruments as diverse as the one-string goge of sub-Saharan Africa, having a gourd sound box covered with iguana or boa skin; the North Indian sarangi, with playing strings stopped by the fingernails and 35 sympathetic strings; and the rebab, a spike fiddle whose quavering song floats on top of the metallophones in the gamelan orchestras of Java and Bali. Western classical players sometimes use “fiddle” as an affectionate term for the violin, that intimate companion and workmate. But in the United States, most often “fiddle” means the violin as used in Irish-Scottish-French traditional music and all the descendant American styles: Appalachian, bluegrass, Cajun, etc. On the surface, this kind of fiddle music is technically less complex than classical violin (though sometimes very fast!). Many fiddle players never leave first position. But fiddling calls for great skill in producing the rhythmic and melodic lift originally intended to get people dancing and keep them that way. Even when we’re just listening to a well-played fiddle tune, chances are we’re moving our bodies somehow – tapping our feet or fingers, or nodding our heads. The emphasis tends to be on rhythmic drive and a steady flow of melody through basic forms, often AABB. This structural simplicity opens up room for variations and impromptu embellishments; the fiddler’s artistry lies in the nuanced bowing and subtle variety with which these deceptively simple tunes are spun out. There’s another fiddle tradition, with very different values, in African-American music. Here “fiddle” and “violin” get mixed up in some interesting ways. Before jazz and blues emerged around the turn of the 20th century, there was already a long tradition of black string bands that used fiddle and banjo far more than guitar. Continuing on into the 1920s and ’30s, the string bands listed the instrument as violin on their recordings. That line also serves as the title of a collection of African-American string-band music with eloquent historical notes by producer Marshall Wyatt. The later string bands featured original songs with violin accompaniment in a new bluesy style that takes the voice as its model, playing in loose unison or trading phrases with the singer. Even during instrumental breaks the violin breathes, taking time for pauses and long-held notes. 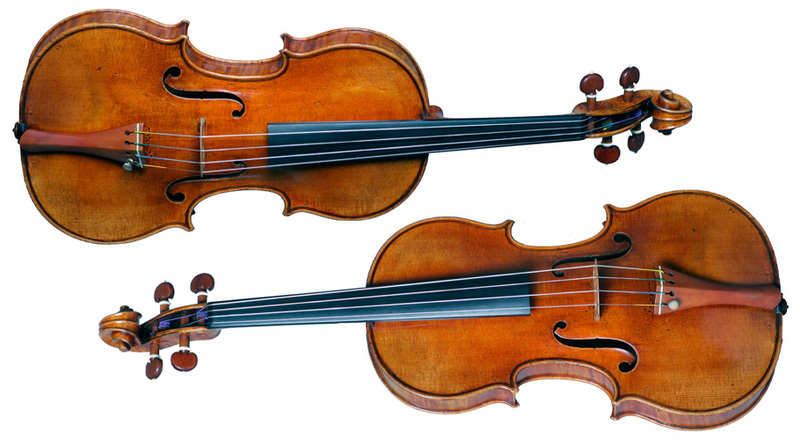 Tempos are generally relaxed, giving the players space to deploy a wealth of violin techniques: playing in higher positions, broad slides, vibrato, tremolo, or pizzicato. In contrast to Western-Classical violin standards, the European-American and African-American fiddle and violin styles share a wide variety of ways that players set up and hold the instrument. They may fatten the curve of the bridge to facilitate double stops, or cut the bridge lower than the classical norm for an easier action. Some fiddle players hold the bow stick several inches up from the frog or rest the palm of the left hand against the neck. Still others use what a Classical player would consider a fairly standard setup and hold. For example, during the prelude to a wedding ceremony while guests are gathering, I play some old Irish airs and other tranquil numbers to calm everyone’s nerves. Then, just before the bride’s processional, I often play my own arrangement of Henry Purcell’s Trumpet Tune in the key of D. Setting it this way gives easy access to plenty of double-stops using open strings for a big, bold sound, heightening the anticipation among the assembled guests. At that point, taking liberties with a classical composition, am I playing violin or fiddle? Another hard-to-categorize tune is the waltz “Sobre las Olas”, a simple melody that seems to have led a life of its own – traveling through Classical, popular, and folk idioms – since it was first published in 1884 by Juventino Rosas. He was a Mexican violinista born into a poor Otomi Indian family of musicians. After moving to Mexico City, Rosas achieved great success in his short life (he died at 26) as a composer of salon music for the aristocracy. His works included this piece in the style of the Viennese waltzes that were all the rage at the time. Later, as “Over the Waves,” it became a dance hit in the United States and a staple of the Lawrence Welk Orchestra, with its polished, classically-trained violinists. I first heard the tune in the mid-1950s, played by a studio orchestra, as the soundtrack to Popeye the Sailor cartoons on my family’s primordial black-and-white TV. Then, in 1969, Nashville great Kenny Baker included his fiddle version with a bluegrass band on the classic album Portrait of a Bluegrass Fiddler. All the while, in small towns on both sides of the Mexican border far from TV cameras and recording studios, “Sobre las Olas” was a standard tune at social dances and weddings. Abenicio Montoya of Santa Fe, New Mexico, plays it in that style on the collected recordings of La Musica de los Viejitos: Hispano Folk Music of the Rio Grande del Norte. This beautiful book and three-CD set, written and produced by Jack Loeffler, focuses on traditional Hispanic musicians (including several violinistas) of New Mexico and southern Colorado. Following that path would lead naturally to Arizona and the old fiddle style of the Tohono O’odham (the indigenous Desert People that straddle the border of the United States and Mexico). But that would be a different article! Some of the most interesting music has always come out of projects that cross conventional boundaries of the day, and these days players with prodigious technical skill are busy collaborating across the violin/fiddle boundary. I’m sure the Classical violin repertoire will live forever, as will the vast body of tunes that are clearly for fiddle. But like an estuary where salt and fresh water mix, nourishing an abundance of life, there will also always be a rich musical territory where violin and fiddle music blend, and people puzzle over what they should call that instrument.